Issue 320 of Guitarist magazine (on sale 1 September) will feature a whopping four-guitar round-up of instruments that feature sick graphic finishes. What's more, each is widely available and, best of all, they all come in at well under £1,000. 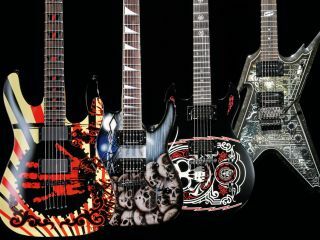 The models reviewed are the Dean Razorback Cemetery Gates, Jackson's DK-T Skulls, the Schecter C-1 Propaganda and one of Anthrax guitarist Scott Ian's signature Washburn, the SI-61. That's not all though. The guys over at Guitarist wracked their brains to come up with what would be a truly aspirational graphic guitar, and were left with only one choice: the Ibanez JS20TH. Released in limited numbers to mark the China Anniversary (20th, in other words...) of Joe Satriani's seminal Surfing With The Alien opus, the guitar features a resplendent 3D inlay of the Silver Surfer himself, alongside a graphic of the sleeve.